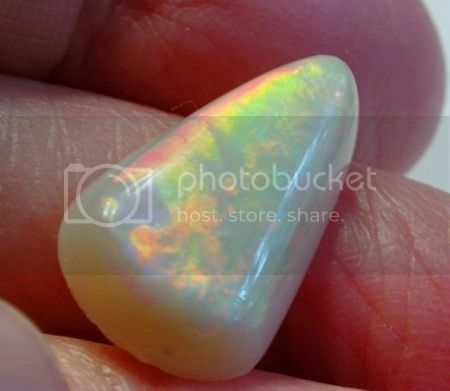 I think I have an opal headache because: 1) I can't carve opals. 2) I can't photograph opals. Today I was working on a couple of pieces including this CP Australian one I decided to give an organic sort of oceany form so I could follow the waving color band and deal with the odd shape of the rough. Spent hours on it with diamond electroplated burrs followed by nova points and am obviously doing much wrong because the polish is still very dull, you can still see the remnants of where I marked out the fire lines, and my photos show almost no fire, even though 80% of the front (and about 40% of the back) has good fire throughout, mostly in colors of aqua pinpoints with red and yellow and green pinpoints as well. Maybe I need to do some good old fashioned sanding before going to the finer Nova points? Why oh why are my photos so terrible? Only the one where I am actually holding the opal shows any of the color at all really, and that one is still bad. Advice? Help! 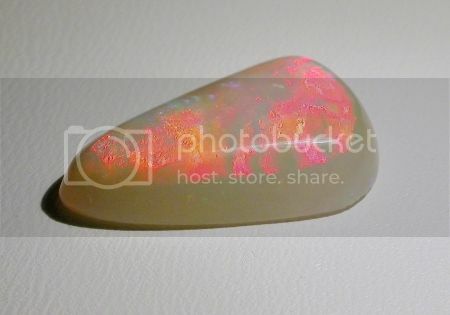 I photograph my opals in a small plastic box that has a black bottom half. I place the opal on the black base and cover it with water. I shine an LED 20 watt bulb on it from the side and make sure the light isn't reflecting off the water's surface. You will be amazed at how the colors will pop out in the photo. Bob's suggestion is a good one. It works. I also used to know a guy who sold opal rough on Ebay and he would take pictures through a 10x loupe with his camera. I never tried it, but he really had nice pictures using that technique. Photographing opals in a manner the represents the fire accurately is frustrating at times. Below is opinion based on personal experience. I am far from a pro with cameras. First, you need the right kind of light. 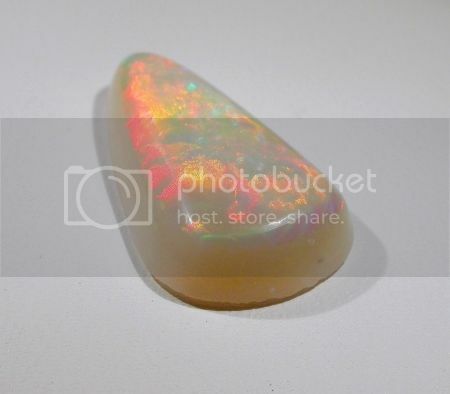 I have a couple little halogens that I used for photographing opal. they came with a sort of mini-backdrop. A black backdrop contrasts really well with white base opal as well. 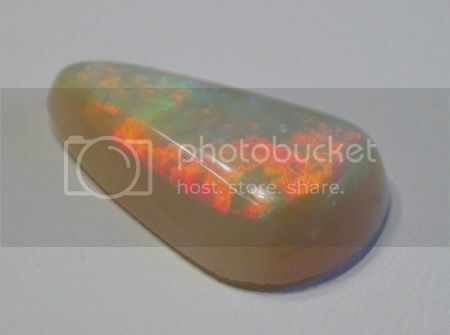 From what I see in your photos, I'd say the light source needs to be a bit more directly above the opal. You're also running into some problems due to the color of the opal itself. It's a really nice white. While that's good for an opal, it causes more frustration with photographing as things tend to get blown out if the exposure is too long. Also remember that from a straight standard camera, you are never going to see the same fire in a photograph that you do in person, because you are viewing the opal through two lenses (your eyes), and the separation between your eyes, when viewing an opal closely, can affect the overall amount of fire that you see vs. what the camera captures. The way light is bounced back off the silica structure in an opal can make some of the fire bits very directional, and the tiny degree of separation between the viewpoint of your eyes can make fire visible to one eye, but not the other. Thank you for the advice! I am working on improving my photography based upon your recommendations. The 20-watt light and water setup bobby1 uses is really good. Light from both sides if you don't have any kind of light box setup is good. 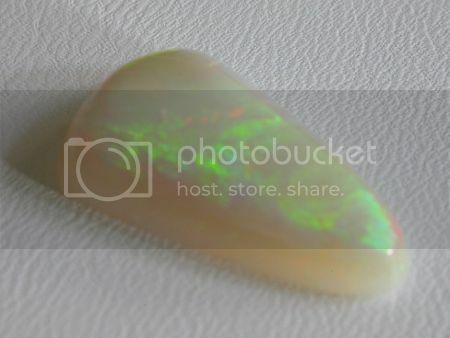 Opal photos "in hand" are actually preferred by some buyers and sellers because the skin tones can show that the colors haven't been tweaked in photo editing software. The reduced contrast between opal and hand instead of black background helps too. I think bobby1 also posted info about photo gray neutral color and gradient backgrounds on the old forum. The auto settings on most cameras can be a headache too. If you have a small tripod you can play around with the exposure and shutter speed and all that. Maybe if you post the type of camera you have a real photographer could offer some settings to start with. Part of my problem is I have just been using my iphone camera. I probably need something better. 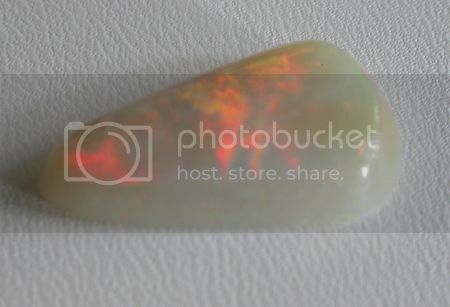 There probably should be a stickied thread devoted to Opal Photography. There are lots of approaches and I don't think there's a one-size-fits-all solution. I've succeeded best with videos but don't have the computer smarts to be able to convert the format from my Canon Vixia to something that will upload here. I think videos are the best approach for opals because they can show the ever-changing color patterns that are beyond the reach of still shots. These images were all made in afternoon indoor daylight using my ancient Nikon Coolpix 4500. The light is from a north-facing window. The focus is a little soft and in the last couple of shots it fell short in the depth-of-field department. Still they show color pretty accurately and illustrate the fact that the color bar is variable based on direction of view. The opal is a Brazilian stone I recently cut. It has a strong color bar on a white base. It weighs 7.22 ct. and measures aprox. 21.2 x 12.7 x 4.7 mm. Hi Ileney, have you seen the post about photography that has written irockhound? I think I could help you. About the polishing of the opal, what sequence of grits have you used? Wow! Beautiful colors in that Brazilian opal gemfeller. 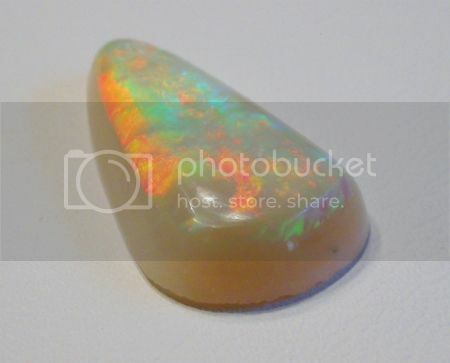 I never seem to see any Brazilian opal rough for sale. Albertto, typically for a cab or something with gently curved, but flat enough surfaces, I would use 220, 600, 3,000, 8,000, 14,000 diamond wheels on my pixie, and then, when I get around to changing out wheels, 50,000 or cerium oxide on a pad. However, for carved pieces, I am first starting and haven't even purchased diamond paste or anything beyond zam, so I just rough carved with burs and bits and then did a very basic starting polish with various dremel bits and the sides of wheels or Novas over the top. Obviously, I can get a better polish on the carved stone(s) with diamond paste with bamboo and felt and toothpicks and more effort, but that is a separate problem from the images. I did review the tutorial on building a light box/photo stand and will give it a try. Ileny, the reason I posted the images was to illustrate that no special light source is needed for photographing precious opal. Incidental daylight works well with proper camera settings. I don't know much about smartphone photography but I've seen some good results from them. Maybe others can give you more detailed info about using them. There's not much Brazilian opal on the market these days. I bought this particular stone in Tucson a few years back already cut. It had problems and I finally got around to recutting it recently. Thank you so much gemfeller!